It's easy to send invitation emails to your customers in their local language. Add an additional parameter to your Structured Data Snippet to change the invitation's language. When you send out invitations to your customers, the default invitation language is the one you select in Trustpilot Business > Get Reviews > Invitation Settings > Email settings. To send out invitations in different languages from the same domain, you need to include two additional parameters in the Structured Data Snippet. These parameters let you specify which template your customers should receive, and which Trustpilot page they should be directed to when they click the link. Note: This article is for those using Structured Data Snippets. For example, for your Spanish speaking customers, you would include the following tags in your order confirmation email. This ensures that your Spanish speaking customers receive an invitation in Spanish and are directed to https://es.trustpilot.com. You can specify the language of the Trustpilot page your customers are sent to by using the locale parameter. With the Template ID, you can specify which invitation template you want to send to your customers. 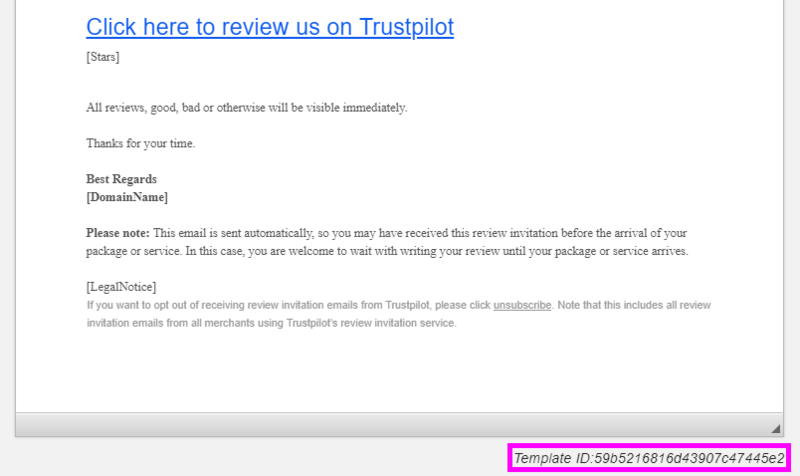 You can either choose Trustpilot's optimized template or your own customized templates. Go to Get reviews and click on the Template Editor tab. Click the Select template button to see an overview of all the available templates. Select the optimized or custom template you want to use and click Continue. You can find your Template ID at the bottom of the template. Note: You may need to upgrade your account to access this functionality.